Responsibility for future generations is easily postulated in the abstract but it is much more difficult to set it to work in the concrete. It requires some changes in individual and institutional attitudes that are in opposition to what has been called the "systems variables" of industrial society: individual freedom, consumerism, and equality. 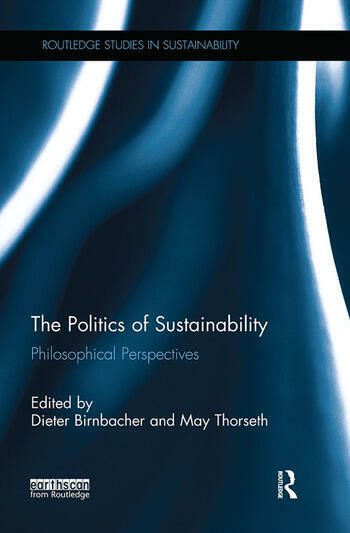 The Politics of Sustainability from Philosophical Perspectives seeks to examine the motivational and institutional obstacles standing in the way of a consistent politics of sustainability and to look for strategies to overcome them. It argues that though there have been significant changes in individual and especially collective attitudes to growth, intergenerational solidarity and nature preservation, it is far from certain whether these will be sufficient to encourage politicians into giving sustainable policies priority over other legitimate concerns. Having a philosophical approach as its main focus, the volume is at the same time interdisciplinary in combining political, psychological, ecological and economic analyses. This book will be a contribution to the joint effort to meet the theoretical and practical challenges posed by climate change and other impending global perils and will be of interest to students of environmental studies, applied ethics and environmental psychology.